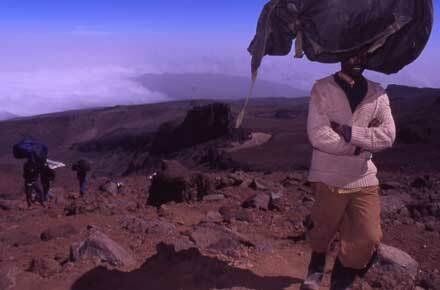 The highest mountain in Africa, a spectacular, charismatic, free-standing retired volcano. Justly famous, and sections of the summit climb can be crowded. Pass through varied ecosystems, gaze at cliffs, caves and lava fields. A wide selection of multi-day treks across the massif, using huts or camping on the lesser known routes. You don't need to make the beyond-tough final ascent to make walking here worthwhile. This is a high, tough mountain, turning into an altitudinous slog at the end, for which you will need to be self-sufficient: be prepared. 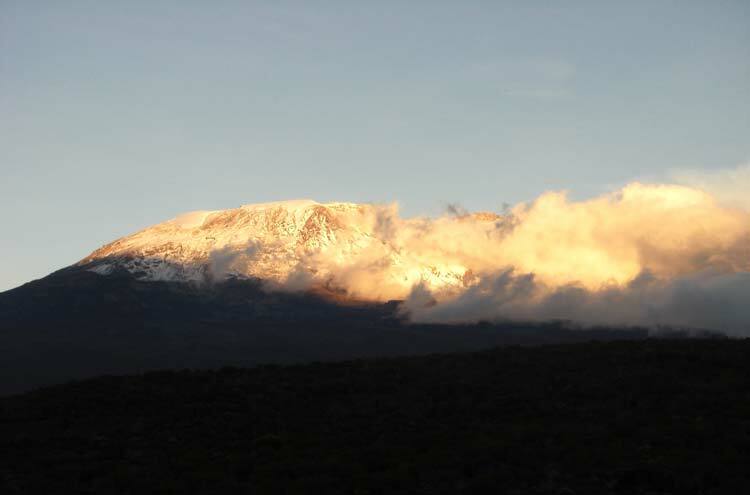 At 5,896m, the highest mountain in Africa, and the highest free-standing mountain in the world: Kilimanjaro is spectacular, romantic and a famous "bag"; but the 40,000 people on the mountain each year make at times for crowded huts and trails on the summit approaches. You will feel triumph and exhilaration if you are one of the 40% who reach the peak, which your altitude misery will not wholly ruin. Most people, though, are too debilitated by headache, nausea or worse to manage the final ascent. This is one tough mother. 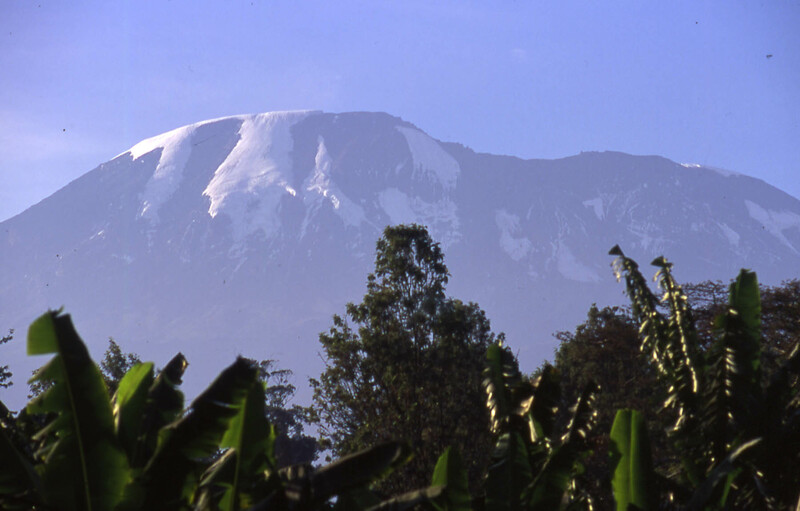 Although now dormant, Kilimanjaro is, amazingly, less than a million years old a blink in geological terms. 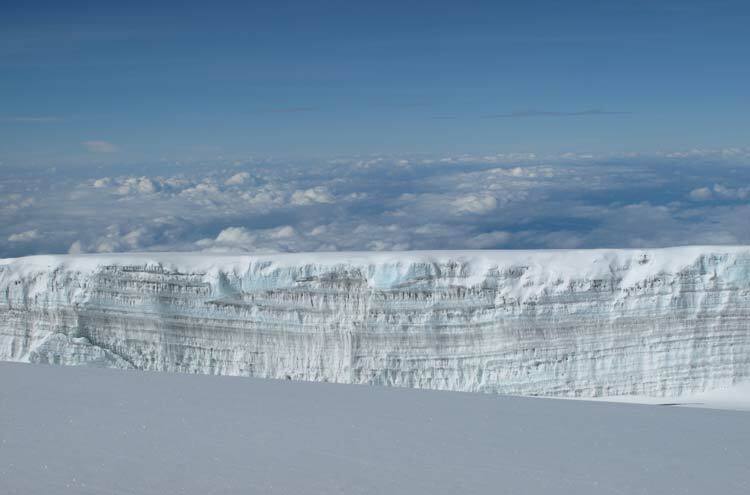 Its vast crater area was, until recently, covered by an ice sheet up to 100m thick the "snows" that inspired Hemingway. 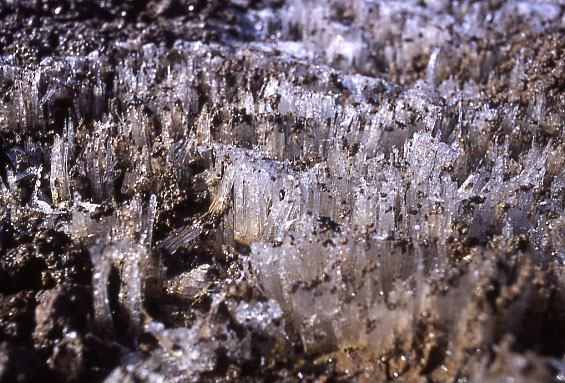 The last dying glaciers are predicted to have vanished by 2040. 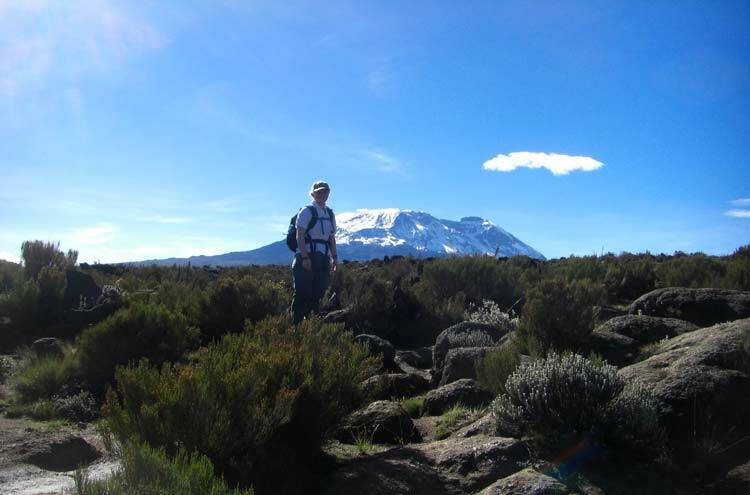 You can understand why Kilimanjaro has been so admired, and draws adventurers from all round the world. A view of it, on a rare clear day, towering in all it majesty above the acacia plains of East Africa, breathes life into that tired word "iconic". 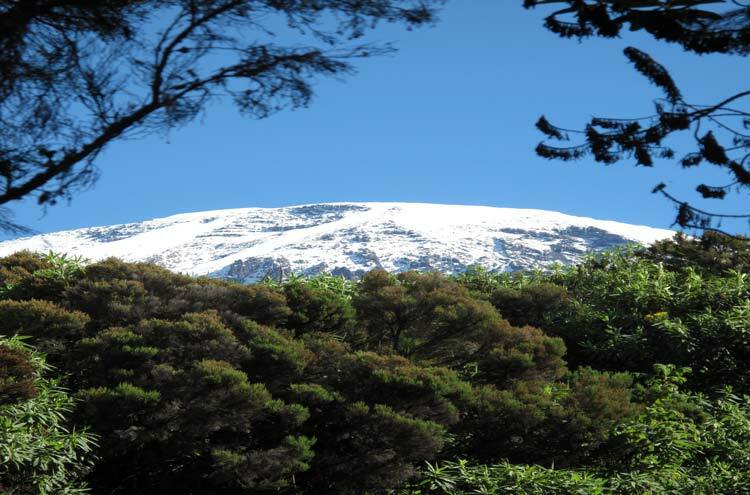 You will ascend through dense rainforest, damp giant heather, sparse scrub moorland, alpine desert, and then rock and ice, deep into a complex of volcanic craters, cliffs and glaciers. 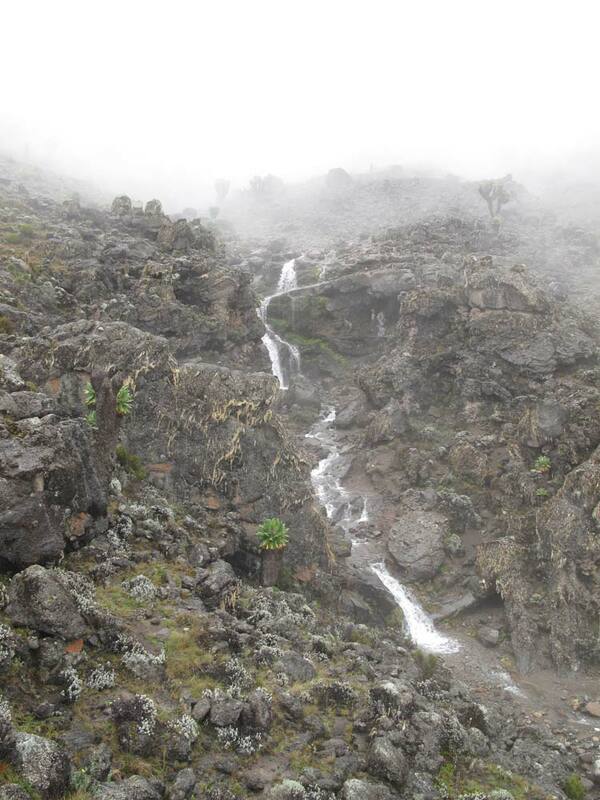 As the trail climbs, you may catch spectacular views across a region of natural wonders and you should spot animals of interest - eagles and buzzards will soar above but bigger game is scarce, unlike on neighbouring Mt Meru. 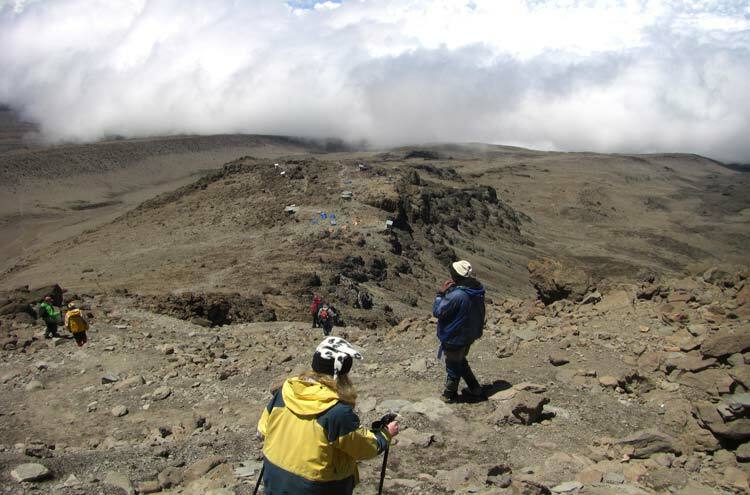 There is a multitude of ways to walk on Kili, whether or not you are heading for the summit. Unless you are set on reaching the summit, a trek across the massif, reaching around 14,000ft so suffering (relatively) less, but avoiding the crowds on the motorways to the peak, are wildly rewarding. 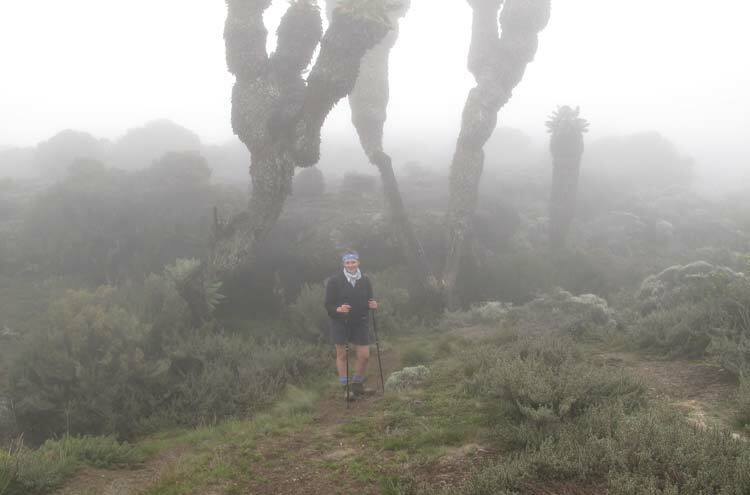 For those with the time and desire, an acclimatising crossing of the volcano followed by an assault on the summit is the best of all options. 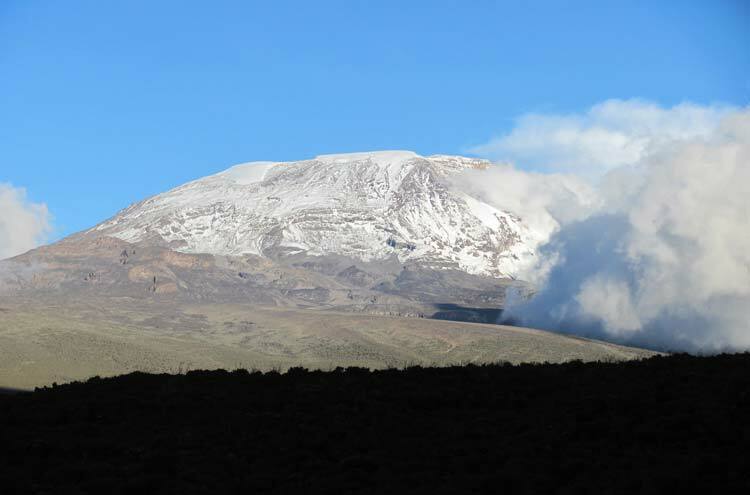 Our Kilimanjaro Summit page gives more information on the ascent to the summit. 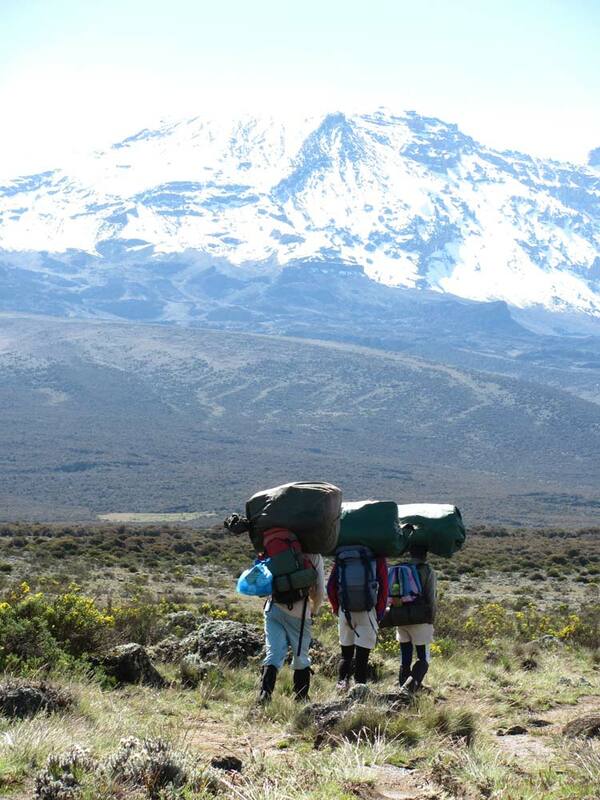 It is a requirement of the Kilimanjaro National Park to have a Tanzanian guide to ensure safety and to organise suitable lodgings/camping, food and porters (you really wont want to carry everything yourself to these heights). 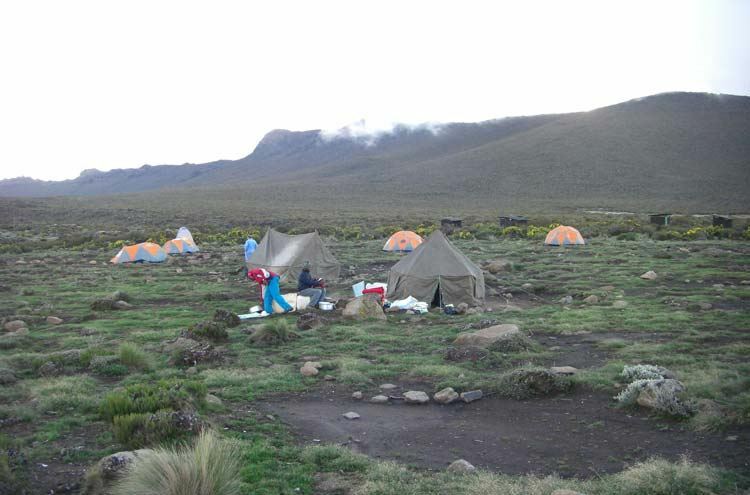 The Machame route (from the southwest) to the summit, which requires camping so is less heavily used than the Manangu route. 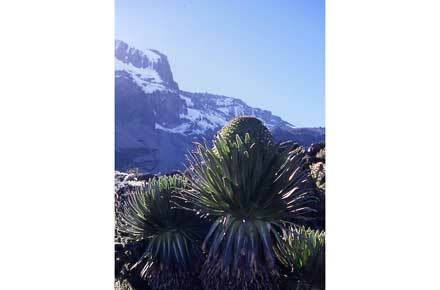 It reaches altitude fairly quickly, but then leaves more time to reach the final ascent, which aids acclimatisation. 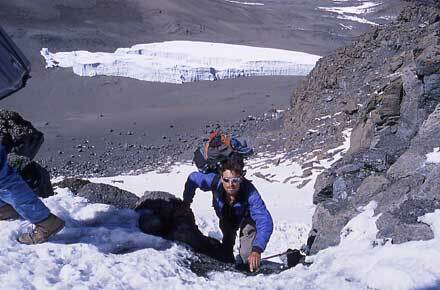 The Manangu (or "Cola Cola") route (from the east) is the shortest route to the summit with huts all the way. 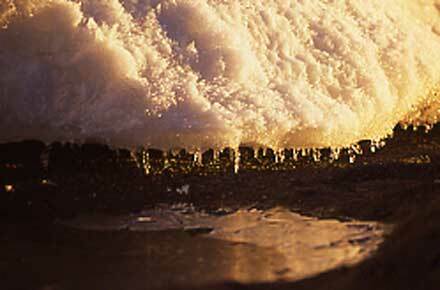 It is heavily used, with crowded huts and a nose bum slog at the end. Avoid if you can. 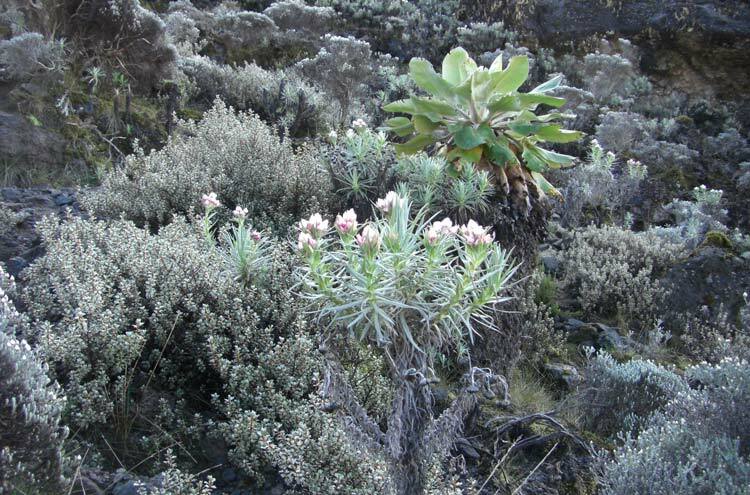 The Shira and Lemosho routes which approach from the west and can be extended to create an almost leisurely ascent and crossing. The more direct Mweka and Umbwe routes from the South are also available, ascending steeply through the cast cliffs of the Western Breach. All these routes involve camping. Remember: the slower you ascend, the less miserable it will be at the end. 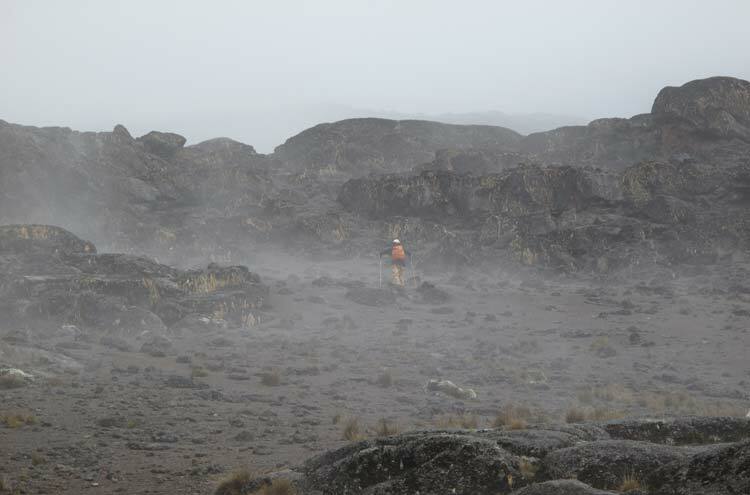 Most of the above routes can be extended or linked up to create longer ascents and crossings of the high shoulders of the volcano. If you are not aiming at an eventual ascent of the summit, you are even freer to choose varied and discursive routes of the (relatively) lower slopes. 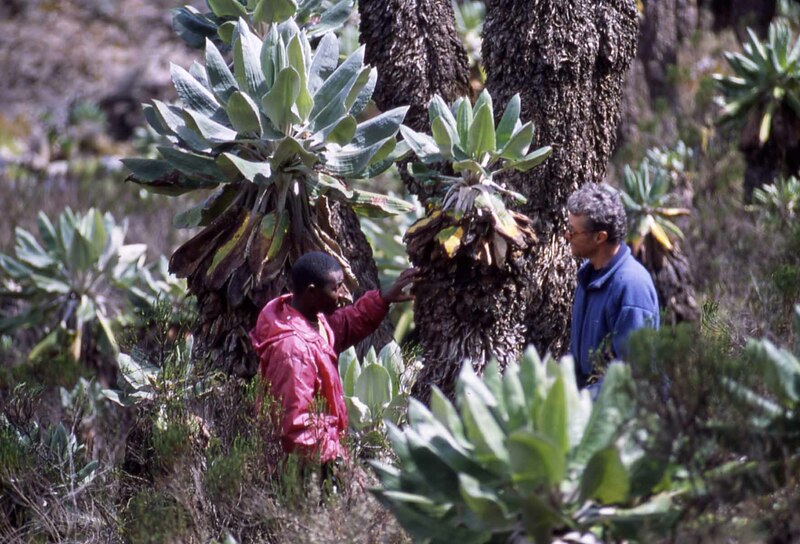 Possibly the best route of all - if you have the time and the money to take more time in the ascent - is Nature Discovery's (see Natural High Safaris; www.naturalhighsafaris.com): ascend the western flank, then walk around the little-frequented northern slopes, to the ravishing Mewenzi tarn, below Kilimanjaro's shattered second peak, then across the desert saddle and up to the summit.